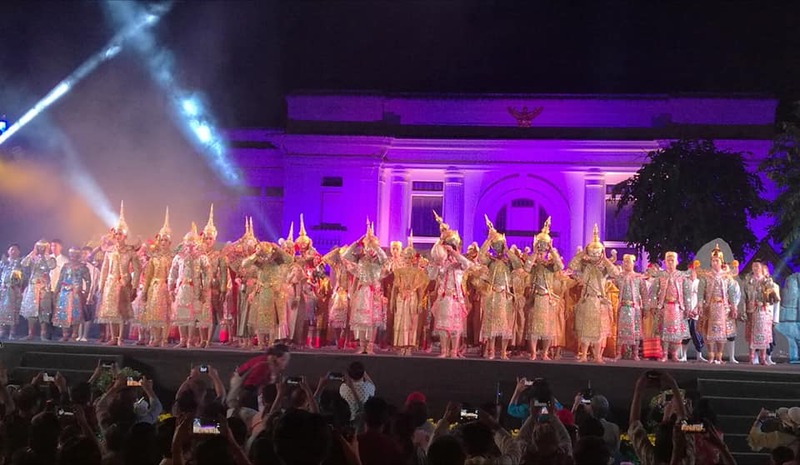 Thanks to an invitation by the Government of Chiang Mai City & Province, we got to experience and enjoy a particularly unique cultural performance of the Khon Thai Masked Dance Drama. It was held at the 3 Kings Monument on an elaborate outdoor stage. It was performed by Khon Salachalernkrung Royal Theater in Thai and lasted about 2 hours. From some research and observations I learned that Khon is a performing art that combines musical, vocal, literary, dance, ritual and handicraft elements. Khon performances – which involve graceful dance movements, instrumental and vocal renditions and glittering costumes – depict the glory of Rama, the hero and incarnation of the god Vishnu, who brings order and justice to the world. It is based on the classic Hindu Ramayana epics. The many episodes depict Rama’s life, including his journey in the forest, his army of monkeys, and his fights with the army of Thosakan, king of the giants. On one level, Khon represents high art cultivated by the Siamese/Thai courts over centuries, while at another level, as a dramatic performance, it can be interpreted and enjoyed by spectators from different social backgrounds. Khon has a strong didactic function (intended to convey instruction and information as well as pleasure and entertainment) of reinforcing respect for those of a higher age and status, mutual dependence between leaders and followers, the honour of rulers and the triumph of good over evil. Traditionally, Khon was historically performed in the royal or princely courts, and in dance masters’ households. Concerted efforts are made to ensure the continuity of the practice, including through the establishment of training and performance clubs that help reach out to young people. Last year for 65 anniversary of Australian-Thai diplomatic relations the Khon Masked Dance was performed at the Sydney opera house. It was a fascinating Thai cultural experience and spectacular performance.